The Detroit Auto Show has already brought us a Triple Yellow 2015 GT, now we have the first underhood shots of the Mustang’s new 2015 4 cylinder Ecoboost engine. 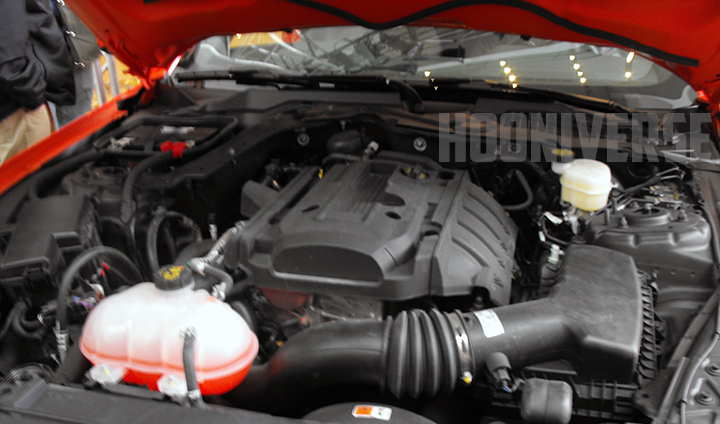 It’s not pretty, but this is the first glimpse at the 2015 Mustang’s 4 cylinder engine, courtesy of a Hooniverse insider. Ford had deliberately removed the hood latches from these prototypes prior to the show, but somehow, someone was able to pop it open for a few closeups and even a short video. If it looks rough to you, that’s because Ford likely has this car no where near where it would be if it was a production model. What could be viewed as a giant pile of plastic right now will hopefully see a nice overhaul before final production. Let’s hope for a nicer engine cover and a more aesthetically pleasing coolant reservoir. And while final specs on the 2015 Mustang’s 2.3L EcoBoost engine are nearly final, actual horsepower and torque numbers are not verified. Ford has said they would come in somewhere at or greater than 305HP, but the exact figure is yet to be determined. Previous Entry Vote: Hot or Not? 2015 Mustang GT in Triple Yellow! CAI, exhaust and a tune should get this thing around 340-350hp plus the weight saving of 4 cylinder engine, auto with paddle shifters this car has some potential to be a fun little car if you can get past the sound of a 4 banger in a stang. Cai will not affect the performance. Its turbo. I saw them put one on a F-150 ecoboost I think it was a K&N with a tune and exhaust and it gained 60 hp there must be something to it. Just look at that factory airbox how restictive it must be. CAI always affects performance. If it’s a cork, removing it will allow the same turbo to flow more air. Same reason you put a big CAI on a supercharged V8.